After we successfully completed our ‘Road Trip from Bangalore to Rajasthan in our beloved Fiat Punto‘, Neetan was yearning for more driving sprints. He was strongly inclined to do a road trip to Ladakh from Bangalore in our Fiat Punto. But, I was overconfident that he could not do it – for two reasons. One being, I had entirely planned the Rajasthan trip, right from booking hotels to finalizing the itinerary and even finalized the routes and roads we were supposed to drive on, so I assumed that Neetan would be too busy with work to dig into all these details for his Ladakh trip. Second being that our son was just born and I thought(which proved to be a myth later) that he would certainly not leave me and go, No chance! – I thought. One week into the departure date, I realized that Neetan was indeed leaving me and my little one back home and was all set to conquer Ladakh!! And his apprentice in this mission would be his cousin Dheeraj and Neetan’s best buddy Madhuranath. I was disappointed – Oh, sorry. Actually Jealous! Though ‘How can he leave me and go?’ ruled the charts, the bigger question that eluded me was that ‘How can he leave me and GO TO LADAKH?’ How many dreams I had about this place, how many travelogues I browsed about it, how many pics I have seen of it. In fact, everyday, our drive back home from office was filled with me elaborating the travel tales I had read for the day to Neetan. And suddenly I’m told – ‘Next time baby. I shall and see if all is well and take you there another time!’. I will obviously feel jealous and cheated. Isn’t it?? After I was convinced and consoled that there will definitely be another drive from Bangalore to Ladakh with me and the little one, the jealous feeling toned down(but not gone completely till date!) and fear set in! I had seen enough pictures and videos of Ladakhi terrain and I had good reasons to be afraid. And Mr.H.V. Kumar came as a messiah and guided in every step with detailed itinerary and regular updates – All in good will, without expecting anything in return. He had guided us in our Rajasthan odyssey too. So when he set his foot in, I was relaxed. P.S: Many pictures here are shown, as seen from the window frame or dashboard of the car. These were not edited to crop into just the scenery – to give an idea of how the beautiful landscapes envelope the drive! Let’s begin, the journey from Bangalore to Ladakh!! And the views from the dashboard starts to get better! A partly broken bridge ! Dheeraj pointing out something to Neetan. Sadly these views will be missed as this road will be seldom taken now due to the construction of the new Jammu-Srinagar road tunnel! Look how dirt has clinged onto Punto! Yeah! Bring on the Swag! Look how cars look so tiny! And sheep ferried across the roadways! Time to fill Punto’s tummy!! Neetan fetching some water in Gulmarg! A beautiful shrine in a lovely backdrop!! Looks so beautiful in the picture. Imagine how it would have been in real!! Filmi!! Green grass, white flowery expanse, and a running horse !! Neetan staring at the majestic mountains! Punto resting for a while! Spot the tiny Tata Sumos!! Views from the window pane! Just look at the colors!! View from Punto’s back seat. Windows can be rolled down only halfway, hence glass is seen in the lower half of the pic! Oh! Please, Give me a break!! It’s so beautiful! How could I be left out from this drive!! Arrgh!! (*Neetan who is sitting beside me right now, is getting some serious rants*. Punto tackling a water crossing in Zojila! Flag flying high! 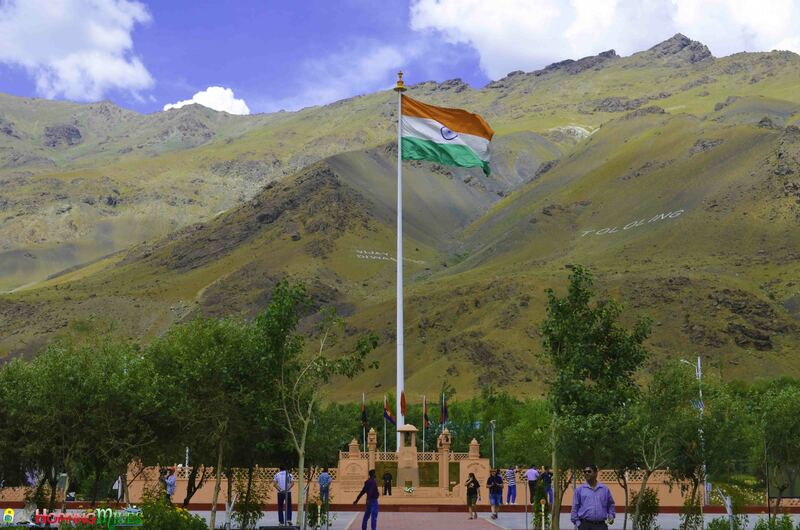 Kargil War Memorial! Along the river, beside the mountains! Icing on the cake – Oops, mountain! After driving through Kargil, they tried to enter Zanskar Valley. They pushed till Rangdum and turned back due to rough terrain which couldn’t be handled by Punto and kept it pending for next time. And they had a surprise waiting for them. A landslide in Kargil!! They were struck in Kargil for 2 days. Punto was parked somewhere far amidst a long queue of vehicles. And they walked till the town where they rested and went back to get Punto when the road was cleared after 2 days. Lamayuru – Moon like landscapes! Perched high on the mountains! Majestic! Thank you! Chang La Conquered! So, the boys arrive in Leh, ditch the Punto baby for a day, hire Bullets and drive to Pangong Tso! Views en route Pangong Tso! All the sand! Where is the road? Oh! there it is!! The ever serene Pangong Tso! Attempting to conquer the mighty Khardung La! Oh! yes, Khardung La baby! Look! That’s our Punto there with his Master! On the way to Turtuk! Should I drive or stare at you!! Dear Nature, how can you be so mesmerizing?? Rest for the day at Turtuk! Clouds are so near, yet so far! Punto and Dheeraj(right) in Rothang pass! Check out how Punto tackled Rothang Pass. Totally Nerve wracking!! PC: Madhuranath and Dheeraj. Thanks guys! 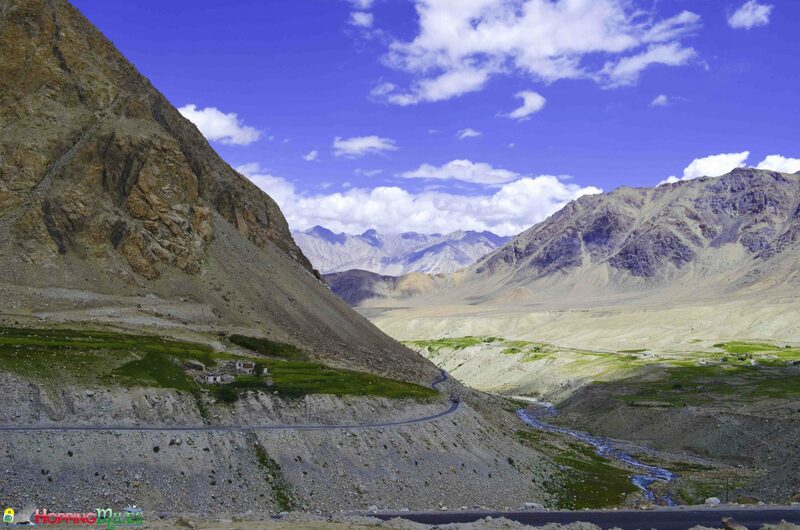 Have you been to Ladakh? Loved the drive? Hit us up with your views in the comment box below! Loved the simple way it’s written and picture speaks words. Good luck. Would love to read more such travelogue. Enjoy being on the road. This article has more images than the information all though it is quite interesting to see the images I’m mesmerized with the beautiful pictures. thanks for the great share.